someone else's children. This is very risky business! I realize many child care providers do this, but have you checked into your automobile insurance as well as your child care liability policy? 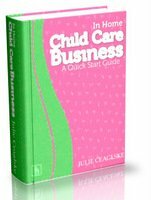 I go into greater detail on this subject in my book; In Home Child Care Business. A Quick Start Guide! Grants for child care providers are available through both state and the federal government. And since states vary on grants, I would start by checking with your local Child Care Resource and Referral or Department of Health and Human Services, or what ever department you are licensed through.